The aspect of niche marketing that I am most interested in is how the design of a size correlates to its ability to sell, or in my case it’s CTR (Click Through Rate). Since I have a heavy background in science (I’m a biochem dork), I love experiments. That’s how I think of my niche sites, as experiments. I do something, I wait and watch. I take notes on a spread sheet of every little detail. Then I try to change ONE thing based on my observations. I wait more, take more notes. If that change was a success I bask in glory for 5 seconds only to start the process over. If it didn’t work, I scratch it and go back to the previous version. I’m sure lots of niche marketers do this. From what I see, it’s the only way to survive. Give them less options. I know it looks nice to have extra stuff and more options, but everything extra you add to the page is one more click that doesn’t result in cash. Narrower is better. I know most of the web uses larger than 800X600, but I find that my sites which have a set narrow column intended for a 800X600 screen (usually 760px or less) do better. This is likely connected to the first point about less options. The narrow column guides the users’ eyes and gives them a definitive space on the screen to concentrate. 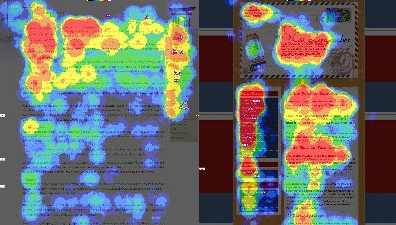 Note: I’ve been reading about eye-tracker tests, and not only is it very interesting, but I think it could prove valuable to niche site creators. Use color to your advantage. Contrasting colors can help you define your content. Use two colors that contrast to call attention to a special section of your site (like your ads) or to your narrow column of content. One great example of what I am talking is a template by Bo Bang of Marketing Syndrome. I used this high CTR template on my Sump Pumps site, which is an idea I also got from Bo Bang. You can see how this template calls attention to the ads by negative contrast. The Ads aren’t a color that sticks out (their white in fact). Instead, the header above and the content below contrast against the plain white of the ads to make them stick out.